Valves! Who uses this term nowadays? They are vacuum tubes, or just “tubes”. In the old days before the transistor they were known as valves. Why still refer to them as such? You will have one legitimate reason to use it if the company you own is named Valve Amplification Company. The mnemonic of the first letters forms “VAC”, as in VACuum tube. In electronics, a thermionic valve is a device used to create or manipulate an electrical signal via the thermal transmission of electrons in a low pressure space. 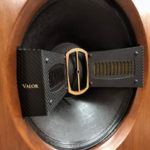 The success of VAC is owed to the functionality and beautiful sound of the electronic valve. VAC is the vision and passion of Kevin Hayes, who founded the company in 1990 with the practical aid of his father, the late Channing W. Hayes. I never met Hayes the senior in person, but had a few brief, pleasant conversations with him. Even as his health deteriorated, he often manned the phones at VAC. You can gain some insight into the culture of excellence at VAC by reading Kevin’s tribute to him: http://www.vac-amps.com/cwh_tribute.htm. The way the Signature 2 is made certainly makes a statement. It’s designed by what Kevin calls, “first principles” engineering. The goal is not to end up with “mere hi-fi,” but to bring the music back to life. The engineering problem, the design, is broken down into component parts, attention is paid to each stage and all the ways the stages can interact. Emphasis is placed on the dynamic flow of the signal. Kevin likes recalling the words of Daniel von Recklinghuasen, an engineer at H.H. Scott and editor of the Journal of the Audio Engineering Society, “If it measures good and sounds bad, it is bad. If it measures bad and sounds good, you have measured the wrong thing.” I’m in no position to tell Kevin if he’s measured the right thing, but I am in a position to weigh in on sound, and this preamp sounds tremendously good! Kevin makes it a point to call his products instruments. There is a huge difference between a tool and an instrument. A tool gets the job done, sometimes quite crudely. An instrument is far more precise, more exacting. My sister is a dental hygienist, and when I visit her for a cleaning she will utilize dental instruments. One called a “root planer” has an elongated razor sharp curved point; think of a miniature Grim Reaper’s scythe with a twist. It’s for poking into the space between the gums and the tooth’s root to scrape plaque off the tooth. You can’t use a toothpick, a rude tool, for such exacting work. You need a honed device made to much more exacting specifications and applied with much more care. When I return home from a visit to my sister’s dental clinic after being subjected to her instruments I run my tongue across my teeth and they feel gloriously clean, natural, and beautiful. Similarly, when I sit in front of the instrument which is called the Signature Preamplifier Mk 2, my ears feel as though they have undergone a cleansing experience. Kevin Hayes is a type of “musical Hygienist, working with exceptionally refined instruments to clear away acoustic plaque from the “teeth” of the music. As the Signature II runs music across my ears they hear something rapturously clean, natural and beautiful. My ears have never felt more pampered. However, before I expound at length about its sound, let us turn our attention to the finer points of this instrument’s construction. When I say finer points of construction, allow me to demonstrate with an example. Much is made nowadays of preamps with hand wiring, and some even tout hard wired connections, of which the Signature 2 also boasts. However, an example of the fanatical devotion to detail and defiant stand against mediocrity is found in the fact that a specific internal wire is chosen for its sonic properties for each section of the signal path. The sourcing of these wires is tightly controlled, such that if the precise wire is not immediately available, even though an alternative might be made to similar specification it will not be accepted as it has an inherently different sound. At times, production has halted for up to eight weeks until the precise wire from the desired manufacturer has been supplied. I do not flinch when considering that method of operations. I conducted extensive tests with entire sets of cables on systems for years. I know what one power cord or one set of interconnects properly placed can do. I often tune systems by the swapping of one or two power cords of silver or copper. If the goal is the supreme transmission of the signal through a highly calibrated system, then substitution of parts is not acceptable. Would another manufacturer, pressed by demands of production, swap out the wire and call it good enough? Possibly, however VAC will not; something to consider the next time you have a statement piece in for repair/upgrade and it takes a while longer than you anticipated, or the fulfillment of your purchase is delayed by a few weeks. You do want the ultimate, don’t you? Kevin will ensure that you will get no less. A preamp such as the Signature 2 should sound about as good as it gets considering the eight years of R&D invested, minimalist signal path, high quality components, zero feedback, and direct-coupled Class A1 triode design. It contains no coupling capacitors from input to output. However, it does have a fully balanced input, as well as outputs. The optional phono stage is also a zero-feedback design using six low-noise twin triodes, and is switchable to accommodate low-output moving coil cartridges. 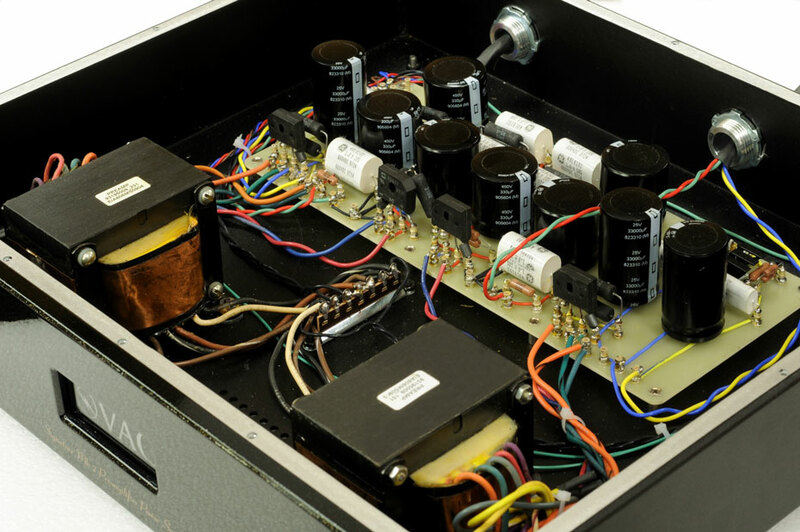 Other phono features include “electrostatic decoupling” to prevent heater circuits from interfering with each other and a separate power transformer dedicated to the phono stage. With the phono stage installed, the two chasses are connected by a second umbilical dedicated for phono. As Kevin states, “It is like having separate components.” The unit I received was outfitted without the phono stage. An aside about the remote control volume, a truly masterful feature described in the Manual as, “…implemented via motorized mechanical devices.” Technically the volume control is a, “motorized multideck potentiometer”. It has two parts, a high quality set of potentiometers and a drive motor, which is responsive to the remote. A common method used in other preamps to obtain remote volume is to use a chip which contains a solid-state buffer and a digital-to-analogue conversion stage. 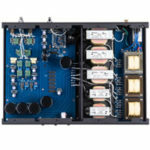 Some companies are putting similar hybrid chips into tube preamps. In contrast to many manufacturers’ use of chip technologies, Kevin considers the “old fashioned” method of mechanically inducing a potentiometer to move to be a superior alternative, with a simpler, purer signal path. According to Kevin, “The potentiometer section is the same sort of part that we would use in a unit without remote control. Ergo, no sonic compromise to gain the remote function.” In audio I like no-compromise solutions. How many high minded preamps have no remote control, as if the Dawn of the Remote had not yet occurred? I have said it before; I want it all, the sound and the convenience. This is truly the only preamp I’ve used which actually delivers completely in both respects. There is one drawback associated with the volume control, the absence of a clear indication of the listening level. There are no markings to allow the user to “find” precisely the correct level, especially in a case where a previous setting is sought. Instead, the golden cheese wedge shaped volume control’s leading edge points to the approximate unmarked location on the preamp’s face. This is a rather unscientific method of indicating the volume. Some picky listeners will be disgruntled at that lack of certainty. I can think of one instance years ago where I was disgusted with the inability to dial-in accurately two integrated amps as they had nothing to guide me in matching their L/R volume! I am not impressed when aesthetics takes precedence over user-friendliness. I appreciate being given maximum information about a component’s operation, but not at the cost of fidelity. The functionality of the Signature II’s volume control demands the elimination of such displays. Over time I found myself fairly ignoring the dial and letting my ears alone tell me how loud the music should be. Working from the utilitarian, nearly military grade back-side to the elegant front, the unit features a 15A IEC, five sets of RCA and one set of balanced inputs, one set of RCA tape monitor inputs, and one set of RCA “Cinema Bypass” inputs. Two of the sets of inputs are selectable XLR/RCA via a toggle switch, and both the outputs are similarly selectable. 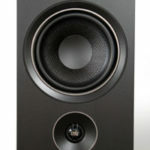 The Cinema Bypass has a fixed level and allows use of a high quality surround system with the preamp. The optional MM/MC input for phono can be eschewed for yet another line input. The outputs include two sets of RCA, one set of balanced XLR, and one set of RCA tape output. The tube complement used for the line stage is two 12AU7’s and two 8416’s, while the optional phono stage uses six 12X7. The main line stage uses the Amperex 8416, a premium twin triode “with high trans-conductance, high current capability and low impedance,” according to Kevin. He calls it the clear winner among tubes of this class. As a two-chassis design, note the extra girth at 18” W x 14.5 D, and 5.5” H, the standard 15A IEC is connected to the power supply, and a proprietary umbilical leads to the line stage. The umbilical is long enough that it should be possible to separate the chassis by approximately four to five feet. The slightly oversized CNC machined black powder coated ¼” aluminum casing for both chasses is fronted by a gold flecked faux black marble faceplate. There are no ventilation openings in either case, and the two units never ran hot to the touch even when left on overnight. This might suggest the possibility of installation in a moderately sized cabinet, however I recommend discussion with VAC prior to doing so. There have been two running changes to the volume attenuator over the past nine years. Over that same time period the premium Cardas rhodium RCA jacks were adopted. Earlier in 2009, variable loading was added for the phono equipped models, and the meters were deleted from the power supply. The retro styled meters, similar to McIntosh’s, but with beautiful “VAC Vanilla” colored backlit illumination, remain on my review model, labeled “Audio Supply” and “Heater Supply” indicating the status of the power condition. They look gorgeous but never once budged from their 12 O’clock operating position in the entire review period. If they show the amp is in stasis, then I can see why they would be eliminated; I mean, what good are needles which never move? And if they did move, odds are you would know there was something very wrong with the power supply. However, I sure like retro look and vanilla colored lighting. To my eye they are more tony than the dancing blue meters on the McIntosh Lab MA 6300 Integrated I reviewed. Two channel balanced vacuum tube preamplifier with external power supply, remote control, and optional phono stage. 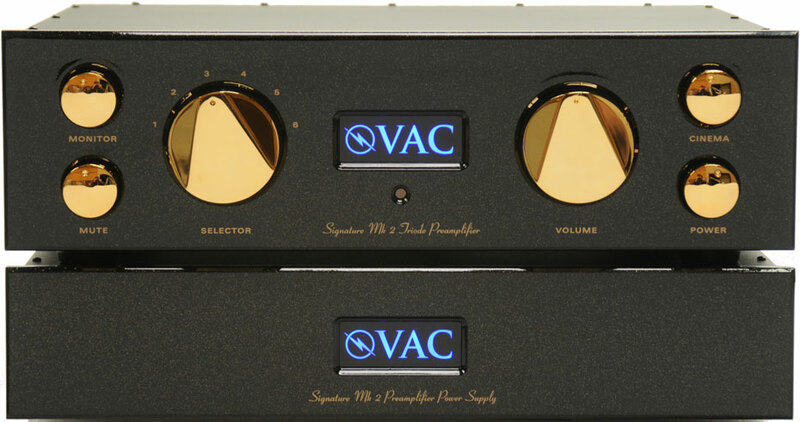 Doug Schroeder article on the VAC Signature Preamplifier Mk 2 Review. One of the better reviews that has made my mind up to buy one of these pre-amps, thanks Doug! Ditto. Doug, your review was instrumental (pun intended) in my decision to purchase this preamp to replace my beloved VAC Standard LE preamp. In terms of upgrades, this represents a significant jump from one end of the spectrum of VAC offerings to the top of the range (well, almost. 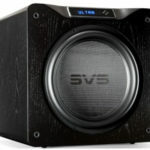 The new VAC Statement Line Stage $47k and Phono Pre $50k are on another planet altogether). My Signature 2a just arrived with Phono option installed. I’ll be setting it up and burning it in over this weekend. If even half of what you’ve experienced with this pre comes to pass in my system, sonic euphoria will be experienced. If most or all the benefits you wrote of show themselves, especially since I’m connecting it to my VAC Phi 200 amp, there will be no leaving the house for a few weeks (and I’ll hold you accountable!). Thanks Doug, I’ll post my impressions on A’gon when I emerge from the Man Cave, no doubt needing a shave, a shower, and some sleep. Hello! Do you think this preamp (or the Statement Line) could have a really good sinergy with Audiopax amps, especially the Maggiore M100? Thanks!